I've been browsing through some of the amazing works to come out of Silly Venture and found a superb chiptune by !cube (aka Toni Lönnberg). Hyper Ocean Ride came second in the competition and is also making use of the Atari STe's DMA hardware for those cool drums. I love this tune so had to share it - press the GREEN arrow below! Okay, Mr cube has a great website and is also listed on Demozoo and SoundCloud. I have recorded a video of his "Meet !cube" musicdisk which you can download here and I must say that Bullet Sequence is another of my fave tracks (from Silly Venture 2014). Delicious! This is a conversion of the Gamopat original released only days ago at Silly Venture. Our Atari game was developed by Sebastien Lucas of Cerebral Vortex and it works on any Atari computer with a Blitter Chip. 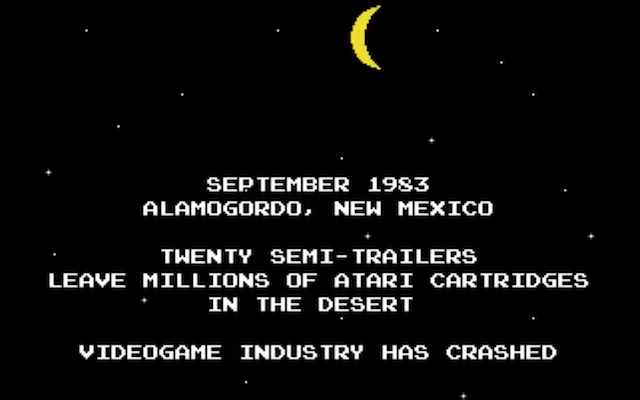 This means the Mega ST, any Atari STe, and the Falcon beast so if your older STFM has an empty socket then you know what to do. When I first loaded this, I wasn't sure what to expect as I was greeted with an authentic 8Bit-styled platformer with fantastic gameplay. It's based on Donkey Kong with a hefty dollop of Popeye and takes place in 1983 before the video gaming industry crash. 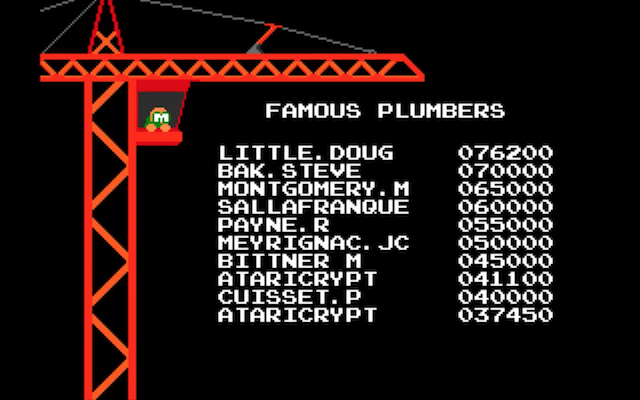 Now, a certain Italian plumber has teamed up with an angry looking monkey and kidnapped ten of our favourite gaming heroes: Pac-Man, Pitfall Harry, Q-Bert, Frogger, and many others. Each is preparing themselves for a hideous death at the hands of these terrible criminals from the east so rescue them all to foil Mario's plan and stop this invasion to save the gaming industry. Yes, everything is on the line here! 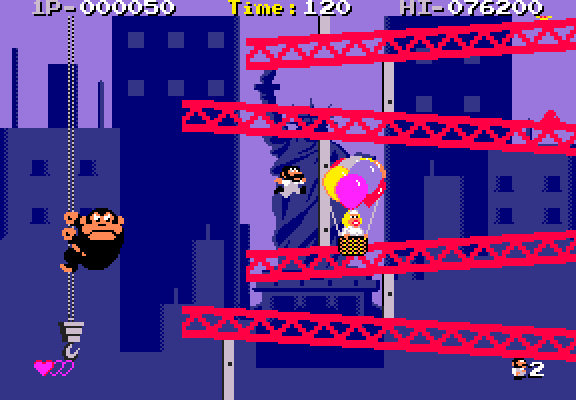 We're on the donkey kong construction site collecting love hearts which are given freely by a damsel in distress who floats by in her hot air balloon. When enough are collected, we begin our steroid-jumping rescue to the top of the screen and save our particular captured hero. Now, this won't be easy because not only is Mario is rolling barrels downhill but King Kong is hanging about throwing his killer bananas with annoying accuracy! Also, some levels have weather conditions affecting your movement but don't forget about the harsh 120 seconds time limit. The graphics are fantastic for a gorgeous 80s retro theme. The sprites are so cute and the Blitter produces beautifully smooth 50fps scrollable screen. 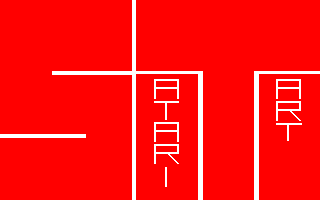 Heck, the Atari STe even adds enhanced colour fading too. Falcon owners get to witness a huge Zeppelin flying by, which I cannot help but wonder why this is missing on the ST/e? Audio is superb with lovely sound effects and a great chiptune that is also totally suited to the ye olde style. Everything is perfect. Don't be fooled by the humble appearance because from the start you're tricked into thinking it's far too easy! The combination of fantastic controls and extremely tough mechanics will catch you out many times - I'm sick of being smacked in the face by a killer banana! 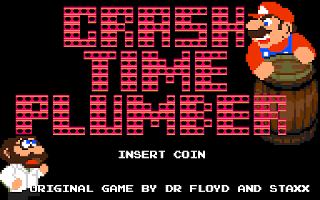 Crash Time Plumber is so addictive and drags you back, kicking and screaming, for more! 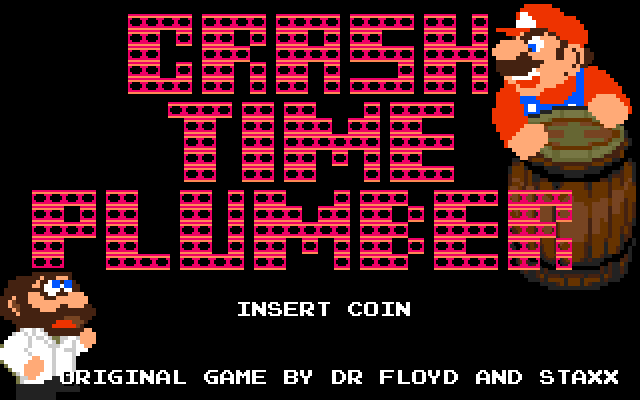 If you only play one game today then I suggest you play Crash Time Plumber!! Download this fantastic game from 8BitChip who have adapted it for hard disk installation and an option for extra lives! Most older STs have an empty Blitter Chip socket to head over to the EXXOS webSTore to buy one. 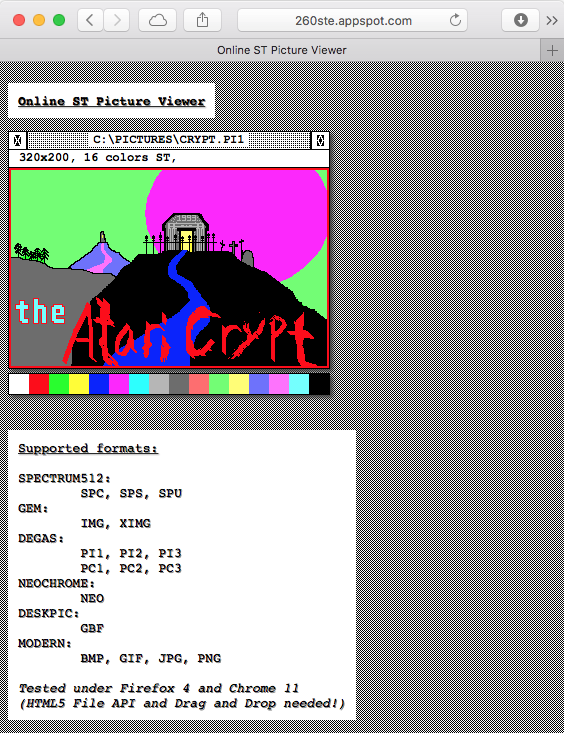 Often I need to quickly view an Atari ST piccy on my Mac and there are plenty of options but here is a fascinating web-tool by Cyprian which allows you to instantly view those old images within a web browser. It supports the classic formats like Degas, Neochrome, Spectrum 512, and even works with drag and drop. What an outstanding viewer. - Get viewing those old 320x200 images right now using Online ST Picture Viewer! Once again, the galaxy is overrun by those damn rocks and is in need of somebody to smash 'em into smithereens. The rocks come in all shapes and sizes and, along with the standard variety, there are popcorn rocks which bloat before eventually freezing. Red rocks will leave behind crystals to conveniently recharge your shield, which is very nice! Watch out for aliens who frequently rear their ugly heads. You should kill 'em as quick as you can to reveal a range of nifty power-ups, such as a double shot or the impressive Ripstar. 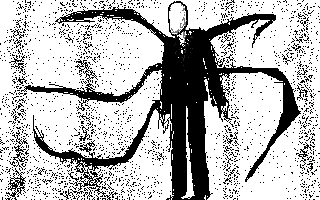 Once all sectors are cleared you will battle the dreaded Mukor, a festering evil entity who fires miniature spaceships using his tentacles - so shoot each of those suckers quickly and then you can watch him scarper like the fatty bloated coward he is! Blasteroids is split into levels and each level is split into several smaller sectors which must be completed before reaching a gruesome End Of Level boss, the monstrous Mukor! Your ship is equipped with upgradeable weapons, a powerful shield, the ability to transform itself and once all the rocks are pounded into dust a transporter appears to whisk you off to the next sector - to do it all over again. Controls are excellent and very responsive. Rotate your ship using left or right, push up to thrust, and keep slamming on that fire button to shoot anything rocky-looking! Gravity and momentum play their parts to affect your performance but don't worry because your shield will help to compensate your piloting skills. Pulling back on the joystick will transform your ship between three different models: the Speeder is very quick and agile, Fighter features the best weaponry, and Warrior is your beefy and burly beast. Your friends can jump in on the action - at any time - with an impressive co-operative two-player support, just like in the arcades. This is a superb feature. Graphics are pretty cool for what used to be a visually stark experience and I love the nicely animated rocks rolling through space. Enemy ships look gorgeous and all sprites a large, details and move smoothly. Oddly, the backgrounds are only 4-colours but you might never notice due to their beautiful design and an artistic flair I really admire. 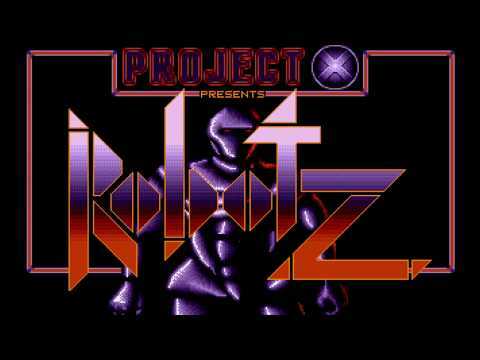 Sadly, the audio disappoints with lame sound effects instead of samples, which would have been ideal and easily handled by any ST computer. Music is also a touchy subject and soon becomes extremely repetitive! Thankfully, it can be switched off but that only highlights the sound inadequate effects... catch-22. Thi is a good arcade conversion with a few silly niggles spoiling an otherwise great rock-smashing experience. Asteroid purists probably won't like it but keep your mind open because it's tons of fun, I just wish the audio was better. However, I fear Stardust is still my favourite but Blasteroids and Asteroidia tied for a respectable second place. - Once again 8BitChip delivers a hard drive installable version! 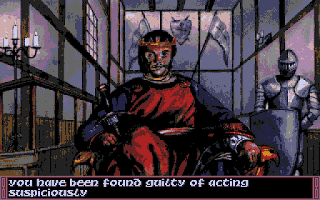 - Those which require the floppy disk versions should visit Old Games Finder. - View the other "Asteroid" games here on AtariCrypt. 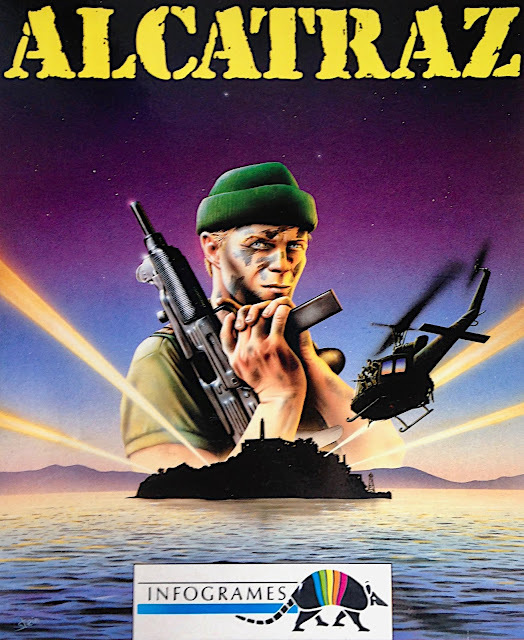 Regular visitors to the best Atari ST gaming website (aka AtariCrypt) will know that I bought Alcatraz earlier this year. Such an underrated game which, takes a little while to master, but offers superb stealth and action gameplay with a first-person scene that still makes me drool. My copy was sealed and Alcatraz is one of my prized possessions! - Those unlucky enough not to own this beauty should download the D-Bug's awesome hack! - Old Games Finder has all the floppy disk versions you could shake a stick at! Having zero artistic flair means I need to cheat whenever I fancy changing the website logo. Thankfully, I've found a couple of free websites that offer fancy text-generating tools and I figured it would be nice to share today's experimentations. Take a look at Picture To People & FlamingText and design your own graphics. 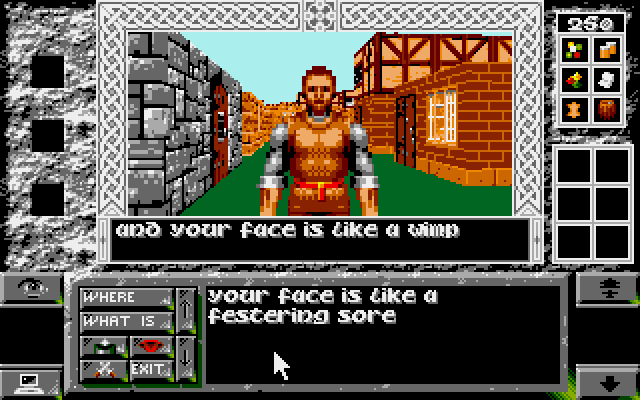 Legends Of Valour is one of the last Atari ST games I purchased and it received relatively favourable reviews. However, I was smitten by its depth and longevity not to mention the first-person aspect and superb packaging! Our adventure begins in the city of Mitteldorf in search of our missing cousin, Sven who previously set out to find his fortune. However, it's been far too long since anybody heard from him and thus our adventure begins. Firstly, you should design your character's appearance, clothing, and armament. 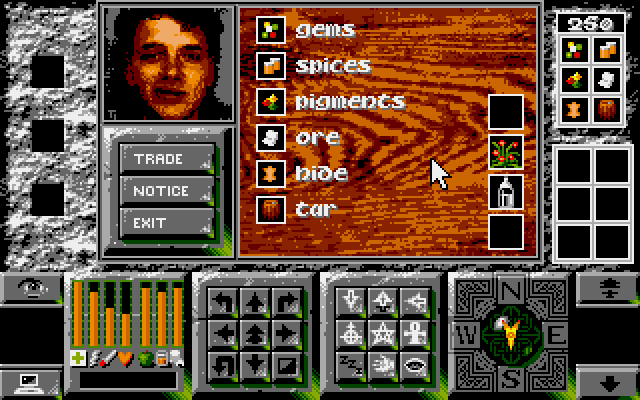 You can be either human, dwarf or elf with each profile offering a different game style and objectives. Select hair, eyes, nose and so on to create your demi-god or (like me) perhaps your character will end up looking like something from a freak show? 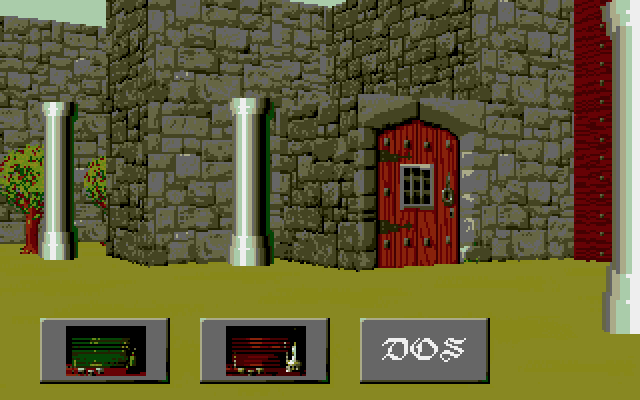 Yes, the first screen really does say "DOS" but it's not long until you begin your adventure. Once you're dandy, enter into the city and heed the advice from the friendly local that pops-up for a chat. I would first advise you take the time to explore and familiarise yourself with your surroundings because this is such a massive place and you will need necessary amenities, like safe lodgings, income, beer to sup, and grub to nosh. Mitteldorf is a fortress city, populated with some very interesting characters, secretive guilds, curious places, and even a labyrinth of dungeons hidden deep underground. Of course, these are just itching to be explored, but be careful because you might not like what you find down there. Your cousin wrote a letter which nicely explains his story, why not take a read? Perhaps it features hidden hints that should help you along your journey. Heck, you never know! All exploration is through a first-person engine not too dissimilar to a shooter like Wolfenstein with fully texture-mapped graphics - a testament to what our 16-bit computer can knock out. This can be configured in three display sizes, small, medium and large. Any ST will be fine but the largest setting requires a 16MHz CPU minimum. Initially, the interface is a little scary due to the huge number of icons but soon becomes intuitive and easy to use. Wandering the city is feasible using the GUI's icons but it can become a little laborious due to the immense size of the play area so a right-click will activate mouse control to unlock its full potential, and is also tremendously good fun. It isn't long before name calling and abusive remarks start a fistfight. Which is never dull!! Legends Of Valour isn't something you simply play - you live it. Life here is completely open-world, a "sandbox" adventure, where you are free to roam and do almost anything you want. This has always been a fascinating concept for me and, although this is an early example of the genre, it works extremely well. 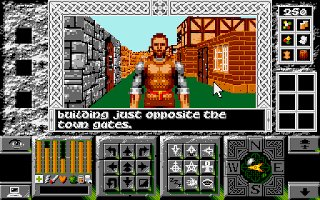 Exploring Mitteldorf is exciting and bursting with fun characters, monsters, temples, stores, taverns, employment and more. I love the Olde English medieval setting which is portrayed and experienced in real-time, so day and night pass by with their own consequence. All the usual requirements we have in life also exist here: eating, sleeping, health and our personal safety when in dodgy locations - especially late at night. I find refuge in a few ales at The Hanged Man tavern is often the best option, but perhaps that's me? Just don't get too tipsy and end up in lockup! 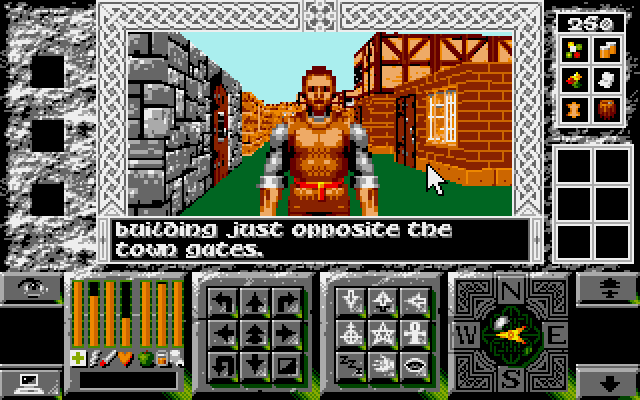 I love wandering Mitteldorf, but nothing is perfect and I feel Legends Of Valour lacks in a couple of areas. The battles could have been thought out a bit better and it's disappointing to discover most buildings are empty of furniture. 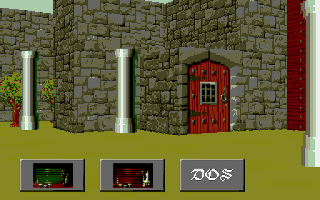 Also, audio is limited to spot effects which is a shame considering the number of disks in the box, I think some ambient samples or more varied chippy fx could have tremendously improved the atmosphere, especially at night. Arghh!! I've been caught yet again and thrown down before the King's mercy. Legends Of Valour is something very special and offers a vibrant and exciting place to live. 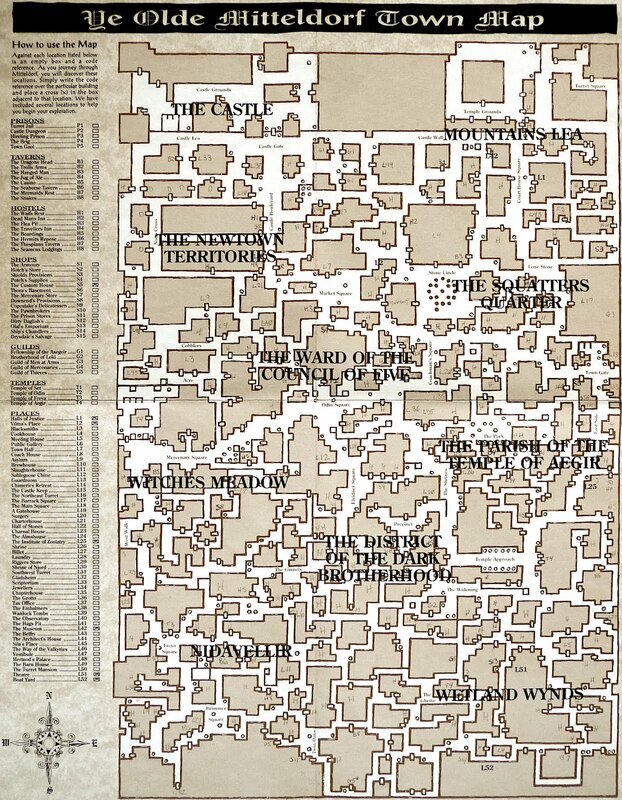 So many cool characters, taverns to frequent, secret guilds to master, monster-infested dungeons to plunder, and then jobs or missions are always on offer. This game has it all and, as you begin to make progress and delve in deeper, you soon realise just how much more potential it features. 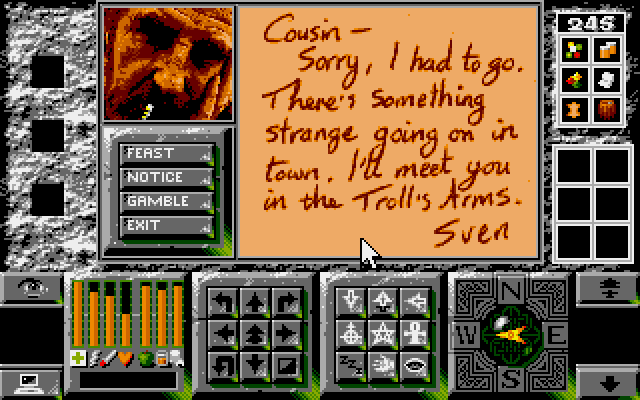 Heck, I had forgotten all about searching for cousin Sven! Allow yourself to get lost in this immensely rewarding adventure because it is most certainly one of my favourite Atari ST games, ever. 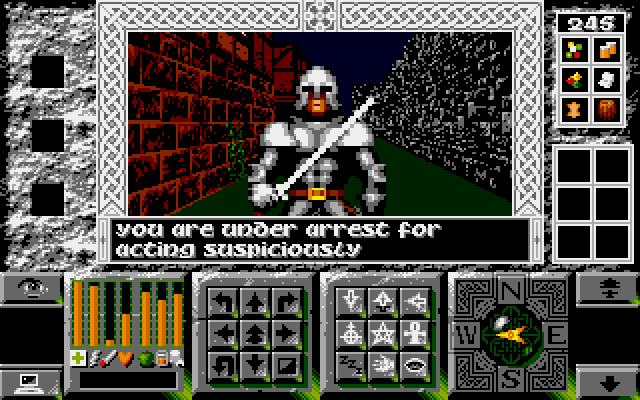 Games like this are best installed to hard drive and 8BitChip has delivered the goods (and with cool scanned images!). However, those stuck using the humble floppy drive should check out Old Games Finder. After a little surfing, I found a cool scan of the city map and a clue book so had myself some fun back in October... Great times!! 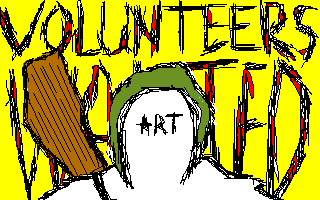 The Atari ST world never ceases to amaze me and today I bring you news of a new demo group calling themselves "STatariART". The name might sound familiar to folk who lurk within FaceBook because it's by Stuart Johns who wanted to a way to promote the graphical flair of all artiSTs. Thus the idea of a new demogroup was born and he enlisted some fantastic people, Peter Jørgensen (YMT Player), Pandafox and Luis Ortiz are all on board. -> Hatari can use SDL2, this will take advantage of HW acceleration and enhance performance OSX. -> Hatari now uses one single CPU core for all machines (ST, STE, TT, Falcon). -> Video emulation now supports the 4 STF wakeup states for MMU/GLUE and a much more accurate state machine for border removal. -> Falcon DMA sound was fixed. -> New support for MegaST and MegaSTE machine types. -> Improvements to Gemdos HD emulation. -> SDL UI reworked with more options. Part two is only playable once the first is complete and our musclebound hero now equipped with a giant weapon as he heads off into the underground. 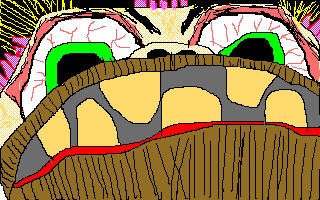 Gamestyle is now a platform shooter where we need to blast everything, even those pesky rats! The controls are a little weird, we must manually guide the directional aiming which is overly complicated. It's quite good fun but I found myself stressing over the control system too much rather than winning! After The War is two games in one, which may sound great but it's not. The beat 'em stage is a little sluggish but it's incredibly good fun and also looks and sounds impressive. I really enjoyed playing this which is more than can be said for the scrolling platformer. Why did they bother? Play for the beat 'em up and a good time is guaranteed!! - Update September 2017: 8BitChip have a brand new hard drive installable download! - Old Games Finder has all the floppy disk versions you could ever desire! 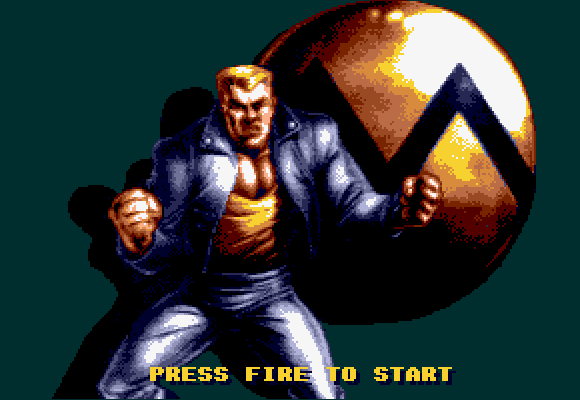 - What a fantastic loading screen - this is killer 16-Bit pixel art!! - Who fancies a couple of cheats?